I received a cutting from Carl & Joy Herzog in October, set it up in perlite in a fancy “Slurpee” cup, added 1 tbsp of water, duct taped the lid (to keep the moisture in), and two weeks later, I had roots! Another option is to thoroughly soak the perlite and then drain it. 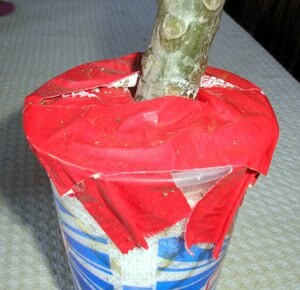 These photos were taken on Feb. 15 after our plumeria meeting, so the roots in the picture have had time to grow a bit. In the beginning, it was kept in a greenhouse that isn’t heated, so the temperature fluctuates with the ambient outside temperature, though doesn’t hit the lows in the morning. In the October timeframe it was relatively hot, in the 80s or higher during the daytime and 50s at night. You can use any large, clear cup (like a Starbuck’s Venti) or buy them at Smart & Final. Here’s a Celadine cutting after rooting in a Starbucks cup. 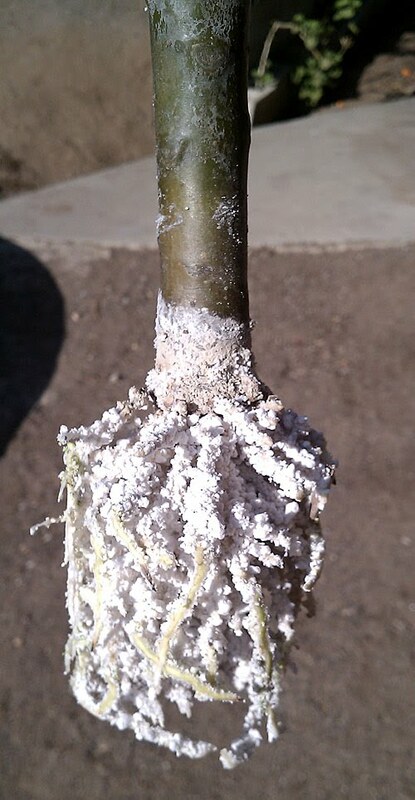 The roots are covered in the Perlite. This was put in a pot with soil.